Don't let the cold winter weather ruin your Winter Veil holiday — keep warm and snuggle up with a fiercely loyal, fluffy pup. This month we're covering the Fjord Worg Pup! 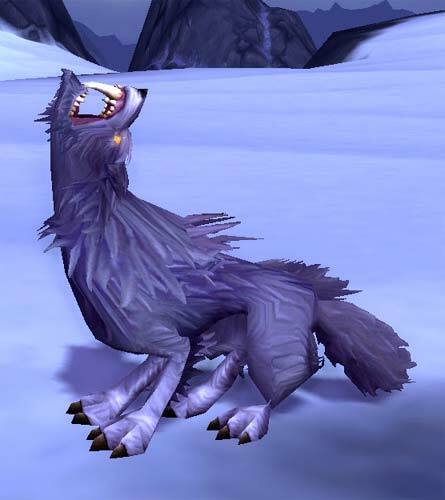 The Fjord Worg Pup is a wild pet that can be found in Howling Fjord, Northrend. Located on the Isle of Spears, west of the mainland, their territory covers only a small fraction of the entire zone. Despite their isolated home, these canines are quite prolific. With many spawn points, sometimes the area will be blanketed with these wild pets. The Fjord Worg Pup spawns in only as a primary pet and has a relatively quick respawn rate. You might need to kill the Fjord Worg Pup's larger counterpart, the Spearfang Worg (level 70-71), should they get too close. Finding the right quality and breed might take some time, but it's still one of the easier wild pets to come by. Which is good news for pet battlers since the Fjord Worg Pup is a prized beast in battles. And for collectors? It's a ferocious-looking yet lovable pup that's great for cuddling during colder months! The Fjord Worg Pup is a high-damage Beast in more ways than one. It has a single defensive move, the relatively lackluster Crouch. In any case most tamers won't want to choose that move because it shares a slot with that game-ending powerhouse, Howl. A multiplicative buff, Howl is an excellent choice in any situation you'd like to pack a big punch. It's also a bit easier to use than most other multiplicative buffs, making it a favorite, and part of why this pet is so favored. The third slot of the Fjord Worg Pup heavily influences your first slot choice. Leap and Dazzling Dance both increase your pet's speed. Leap increases only your pet's speed, but by 100%. With the exception of some very strong PVE encounters and the odd Flying opponent, Leap will always make you faster than your opponent. The drawback is that it only lasts a single round, so you may find yourself drastically lowering your DPS if this is your choice. The more popular choice is Dazzling Dance, which increases your entire team's speed by 25% with an extremely long duration of nine turns. In most cases this is going to be the best choice, because that 25% is going to make not only your Pup, but the whole team, faster than most opponents. That leads us to your first slot which contains the only real DPS the Fjord Worg Pup brings to the table. Flurry is better throughput if you don't necessarily mind the Critter damage, and that 25% boost can assure you hit an additional time every time. Bite is a safer choice if the opponent is an unknown, but the Worg Pup's sheer power still makes this a scary proposition, even before that hard-hitting Howl comes in to play. Be sure to check out Liopleurodon's forum post for additional information on pets with the same moveset as the pup. Other similar pets will have more breeds to choose from if you're looking for variety. Thanks for the post. What is the best breed of this pet?